Frankly, my dear, people actually still give a damn about the classic movie, Gone with the Wind, even 80 years after it premiered in Atlanta, Georgia. This year, theaters across the country have been presenting special 80th anniversary screenings of the epic film, based on Margaret Mitchell’s best-selling saga of the Old South. For those who somehow haven’t read the book or seen the film, Gone with the Wind follows the beautiful, but headstrong Southern Belle Scarlett O’Hara (played by Vivien Leigh) who will stop at nothing to win the heart of the man she loves, Ashley Wilkes (Leslie Howard), and preserve her family’s Georgia plantation known as Tara. Complications ensue when she meets a handsome rogue named Rhett Butler (Clark Gable), who knows that he and Scarlett are truly meant for each other. Oh, and then the Civil War breaks out and turns their whole world upside down. 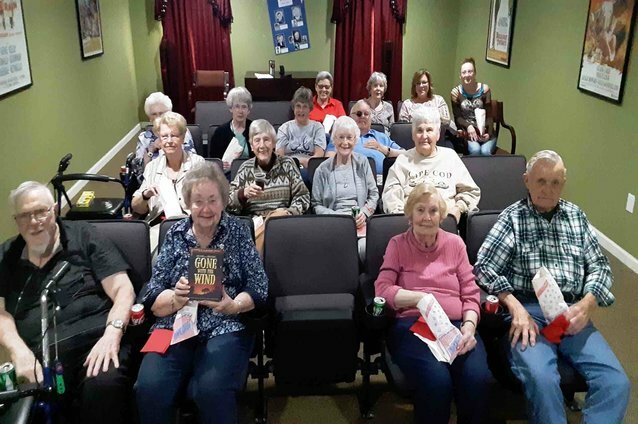 Since the story took place in Georgia very close to Sunshine’s Creekside Pines community in Dallas, Georgia, Life Enrichment Director (LED) Brandi Limbaugh thought it would be fun to have an anniversary showing for residents. Though none of the residents attended the 1939 premier along with Clark Gable and Vivien Leigh at the Loew’s Grand Theatre in Atlanta, Brandi found that the vast majority of the 18 who came to opening night of the screening (a record crowd for movies at Creekside Pines) had seen GWTW before. Lily noted that unlike most war movies today, GWTW didn’t actually show any intense battle scenes, other than Rhett and Scarlett making a dramatic escape from Atlanta as it went up in flames. Brandi enjoyed a lively conversation with Lily about the film. “Lily and I have discussions about all sorts of things,” said Brandi. “She loves to go to art and history museums, and I love that she still has a passion to learn new things. Lily also pointed out that when the slaves were emancipated, many of their old plantations failed during Reconstruction, because they did not have the labor to keep them up. Indeed, the film showed how Scarlett’s family had great difficulty trying to handle all of the work on their plantation. To complicate matters, the slaves that stayed with them did not know how to tend to the crops or the farm animals because they had been trained to work inside the house. Not a single scene was shot in the state of Georgia. Everything was filmed in Hollywood studios and on location in Southern California. While Clark Gable’s casting as Rhett was pretty much a foregone conclusion, there was a lengthy nationwide search for the role of Scarlett, including some 1,400 interviews, in part to build up publicity for the film. Joan Crawford, Tallulah Bankhead and Katherine Hepburn were among those who didn’t get the part. While Hepburn might’ve been great in the role, casting a Northern “Yankee” like her as Scarlett would’ve been an outrage. Ultimately, Vivien Leigh, a little-known English actress, landed the role, after filming had already begun and eventually won the Academy Award for Best Actress. Olivia de Havilland, who played Scarlett’s faithful friend Melanie Wilkes, is the only GWTW actor still living (coming up on her 103rd birthday this summer). She was nominated for Best Actress in a Supporting Role, but was beaten Hattie McDaniel, who became the first person of color to win an Oscar. Then of course, there’s the trivia question for the ages: How did Rhett’s famous last words, “Frankly my dear, I don’t give a damn!” get past the censors, which forbad swearing in G-rated 1939? This blog was first published here: Sunshine Retirement Living, April, 2019. Some information was provided by Wikipedia.org, newsweek.com and tcm.com.